This may be my biggest travel year to date thanks to a move to London that allowed Europe to be a budget airfare away. I gave up my PNW weekend warrior lifestyle of mountain climbing and skiing to jet set around Europe. Even though I lived in London, I was rarely there on a weekend throughout our short commitment in the U.K. I quickly realized how accessible travel within Europe can be and wished that the U.S. had a better infrastructure (budget airfare and trains). Read: 5 Reasons Why Traveling in the U.S. is Traveling. Tip: Some of the month headers link to detailed monthly recaps. The last few years, I’ve been focused on skiing, so it made sense to start the year off “right” by kicking off the New Year skiing at Whistler-Blackcomb. After deciding we’d be moving to London, I stayed local and got as much skiing in as possible. Andy went on a trip to London for work, and we worked on our visas. One weekend, I learned how to cross-country ski and did a multi-hut trip for a long weekend. I can’t believe I quit my job!!! Fortunately, REI agreed to keep me on as a part-time freelancer for two months until they could hire a backfill. It was a great way to make some extra money and transition to a new city. Without much time to think about my last day at REI, I went on a backcountry ski trip to Ymir Lodge with a bunch of friends. Taking a helicopter to a remote lodge was an escape from technology and the fast-paced decisions I had been making for the move. After Ymir, Andy went on another work trip to London, and I had a few weeks to finish the plans with the move and clean up the house (and yard) to rent. We decided to live in Central London in corporate housing for the six month contract. Right before confirming the move date with Andy’s company, I found out I won a ski trip to Utah with Dynastar skis, which included new skis for both Andy and I, along with four days of skiing. We prolonged the move date for a week. I moved to London on March 6th, which is a sentence I never thought would come out of my mouth. London is a big city without big mountains BUT it was a gateway to travel. The first weekend after moving I found cheap airfare, and we took a quick and cold weekend away to Stockholm. 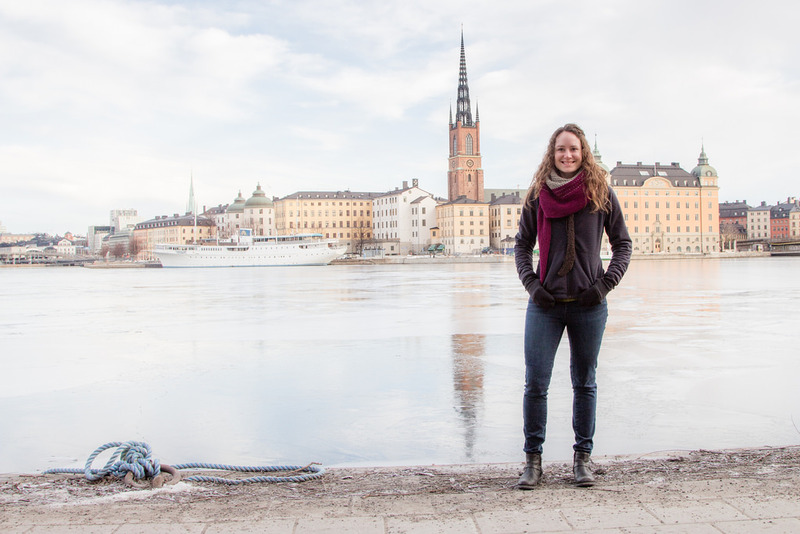 Read: A 48-Hour Guide to Stockholm, Sweden. Settling into London and a weekend in England, we took a day trip to Oxford. A couple years ago, Andy went on a ski trip to Turkey and met Molly Baker, an Atomic athlete who was living in Austria. Wanting to get in as much skiing as possible in Europe, we flew to Austria for a long weekend. During a cloudy day, we took a bus to Obertauern to hit the slopes. Read: A Trip of Firsts: Skiing in Austria. The second day Molly and her boyfriend, Jakob, took us to Schladming-Dachsteinus for a day of backcountry skiing and my first via ferrata. On our travel day home, we took the train back to Salzburg to do some sightseeing before flying back to London. Chamonix was high on the list of places to ski before the snow melted. Unfortunately, Europe was having a bad snow year, which meant this was our second and last ski trip. Checking out a few of the many resorts in the area, we spent two days at Les Grands Montets and one day at Brevent-Flegere. The reason for the trip was to ski the famous Vallée Blanche. We hired Caroline Ware George as a guide, took the cable car up to Aiguille du Midi and skinned towards Italy. After transitioning to ski mode, we skied into Italy to SkyWay Monte Bianco cable car that would take us back into France and connected to the Vallée Blanche. It was a gorgeous day and we skied down to Mer de Glace and slowly descended the steep mountainside on the Montenvers Train back to the village. After back-to-back ski trips, it was time for a tropical vacation over the Easter holiday. I don’t consider myself a beach-goer but did enjoy the hiking to remote beaches and exploring the volcano on the island. Read more: Spain’s Canary Islands: Day Hiking in Tenerife and Spain’s Highest Mountain: A Guide to Hiking Mount Teide. With so many “long” weekend trips, it was time to stay local yet again. The weather was decent on the coast, and I opted for a day trip to the White Cliffs of Dover. At the end of the month, my parents visited England for a week. I showed them around my new city and then took them to the Peak District north of London for some outdoor recreation. We went on a long walk, toured a cave, and did another walk. My dad arranged to tour the JCB Factory, which manufactures heavy machinery. Facebook is good for keeping in touch with distant friends. My friend, Emily, was on work assignment in Amsterdam. Emily and I explored the tulip fields and museums and had dinner with some friends from Seattle who were also in the city on vacation. Read more: Photo Essay: Amsterdam’s Sights, Canals, and Flowers and DIY Amsterdam Cheese Tour. After returning to London from Amsterdam, we decided to book week-of flights to Munich to do the whole beer scene. Little did I know that Emily did the same thing, and we’d get two weekends together. Andy met Emily and we went to as many beer halls as we could. It was a fast weekend but a successful one. Memorial Day isn’t a holiday in the U.K. but was the Spring Bank Holiday. With a long weekend and a friend visiting parents in Pau, France, Andy and I flew into Toulouse for a couple of nights before heading to Pau. Using Pau as a base we spent two days hiking in the Pyrénées and one day driving through the small villages of Basque Country. With travel plans for most of June, the first weekend was spent in London with a day trip for a walk around the Cotswold Hills. June started with a visit from Andy’s parents. He worked as I showed them around London. The four of us took a train to Paris via the Channel Tunnel, or the Chunnel. I hadn’t been to Paris in ten years and was itching to return as a more seasoned traveler. My first trip to Asia finally happened this year. Andy’s work team did a trip to Asia to meet their sales teams. The trip included Singapore, Beijing, and Seoul. Andy and I added a few days in Bali before the trip and a weekend in Japan at the end. Bali was amazing as we stayed at a bungalow overlooking rice fields and rode scooters around. When Andy was at his work events, two other significant others had joined the trip. The three of us would explore the cities during the day and meet up with the rest of the group in the evenings. July 1st is opening day on Mt. Fuji. Andy and I took a bus from Tokyo and spent a night climbing the mountain while passing tea houses and enduring misting clouds and high winds throughout the night. We then spent a night in Japan before flying back to London. After the Asia trip, I had two days back in London to do laundry before flying back to the States and leaving Andy in England. I attended two weddings and met my newly born nephew. It was nice to be back home while staying with family and friends. The day I returned to London, my cousin, Britta, arrived for a visit. She stayed with us for a few nights as we explored the city sights I had been wanting to go see. One of my favorites as going to the House of Commons debates. The next weekend Andy and I joined Britta at her in-law’s house in Geierswalde, Germany. We were invited to a family cookout and took a day trip to Bastei and Dresden before flying home (with an extra night in Berlin due to a flight cancellation). July ended with a weeklong women’s trip to Croatia. Two of my friends from the States–one from Seattle and the other from Atlanta–joined me in Croatia for a week of island hopping and culture. When people asked what my favorite trip was this year, I have to answer Croatia. Andy and I took the train to Glasgow and rented a car to get to the Scottish Highlands. A day was spent enduring the typical moody weather as we hiked to the top of Ben Nevis, the highest peak in the U.K. The following day, we drove around Loch Ness in search of Nessie and distilleries. Before catching our train, we went to a bar to sample whisky and then a local brewery. Two friends from Seattle, Tobias and Bryan, met Andy and I in Norway for a backpacking trip. Hoping to sleep in our tents the entire 10 days and with a plan to link trails on Moskenesøya island. The weather had other plans and we adapted when needed. Finally getting more of our outdoor trips in the books, we headed to the Swiss Alps to hike the Hardergrat, along with other day hikes. The Airbnb was hard to leave with views of the Eiger staring at us from the window. Before the flight out, we spent a few hours in Zürich and had dinner with friends living in the city. Originally scheduled to move back to Seattle on September 6th, most of my September travels stayed close to London. Adding to the highest peaks of the U.K., I took a train to Conwy and took public transportation to climb Snowdon, the highest peak of Wales. The second weekend Andy and I spent the day exploring Greenwich and Canary Wharf. It was the first full weekend I spent in London since June. One night during the week, Andy and I also ventured north of the city to go to Warner Bros. Studio Tour London – The Making of Harry Potter. I took my final trip as a solo one and ventured to Vigo, Spain to visit Kelly, my family’s foreign exchange student that lived with us when I was 15. Originally from Venezuela, Kelly moved to Vigo from Venezuela where her extended family lives. I spent the weekend catching up after 16 years. One last weekend was spent in London walking the streets and taking in the final days in England. We moved back to Seattle on the 27th and transitioned back into our home. It was nice to have a car again. Most of October was spent enjoying the mountains and going on day hikes during the week and searching for a job. The end of the month, I took a rock climbing trip to Red Rocks outside of Vegas with a few friends. My climbing season was just beginning for the year, and I had to get back into shape. Rusted Earth Farm, Asheville, N.C. In the middle of November, I ventured to the southeastern U.S. to visit many of my friends from different periods of my life. I spent two nights in Atlanta, two nights in Chattanooga, one night in Asheville, and two nights in Savannah. The main reason for the trip was a women’s climbing festival in Chattanooga with some friends in Seattle. It was fun to get back east to see some fall colors lingering on the trees. For the second year, I went to Utah for Thanksgiving. I joined a couple of my friends from Seattle and had a feast in our Moab rental. During the days, we found outdoor adventures including running and rock climbing. I end the year grateful for being back to Seattle. Weekday hikes and ski trips continue pop on my calendar in between networking and job hunting days. A highlight was spending a night at Mount Tahoma Trail Association (MTTA)’s High Hut with two girlfriends. The first weekend was spent getting my legs in ski shape at my local resort, Crystal Mountain. The snow was good but the coverage was low. Andy and I had a weekend getaway during a rare window of sunshine to the Olympic Peninsula with friends. I checked off two hikes that had been on my list for some time: Shi Shi Beach and Ozette Loop Trail. It was the first time this year we slept in the Jeep. It feels good to be home. I volunteered one of my ski days on the mountain and helped a youth girls at a Jr. Ski Patrol Day at Crystal Mountain. I met rad women and girls and now understand why onesies rock. I’m ending the year traveling to Pennsylvania to spend time with my family and Andy’s. Two of my nephews are now grasping the myth of Santa, which will make the spirit of Christmas fun less adult and more fun. I’m looking ahead only a few months. I’m still job hunting in Seattle and hoping to find freelance or full-time work. Until then, I have another Ymir ski trip planned for the end of January. I purchased the Max Pass this year and am planning a ski road trip to Wyoming, Colorado, and Utah to use the pass in February. Andy and I are heading to Kyrgyzstan and Kazakhstan in search for backcountry skiing mixed with cultural travel in March. I have many travels from this past year that I still need to write about, so stay tuned and follow along as I share my travel stories in 2018.